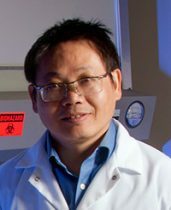 The National Institutes of Health recently awarded School of Medicine researcher Mingui Fu, Ph.D., associate professor of biomedical sciences, a $465,000 grant to conduct a study of sepsis-induced systemic inflammation. Fu said that when completed, his research could significantly advance scientists’ understanding of the regulatory mechanisms surrounding septic pathogenesis and identify a new therapeutic target to treat the devastating condition. A potentially life-threatening illness, sepsis is a major health concern. It strikes nearly 700,000 people in the United States each year with a 30 percent mortality rate. A major contributor to mortality is sepsis-induced systemic inflammation followed by multi-organ injury. Sepsis appears when infectious bacteria or other organisms enter the blood stream and cause an inflammatory immune response. There is currently no specific treatment available for sepsis. Fu’s study will look at the essential role of a particular protein known as myeloid MCPIP1 in sepsis-induced systemic inflammation and death. It will also explore whether MCPIP1 may be a target for pharmacological therapy to improve the outcome of sepsis. Charlie Inboriboon, M.D., associate professor of emergency medicine, will serves as a co-investigator on the study, which will also include the research efforts of School of Medicine students.